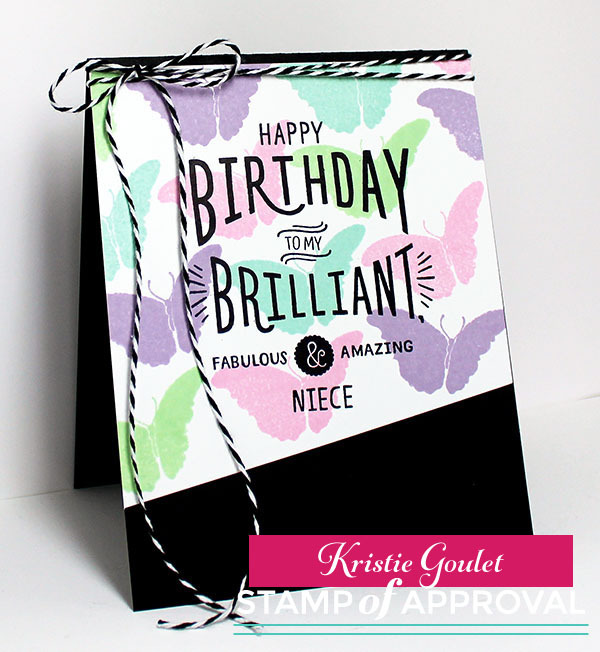 The newest Stamp of Approval Collection from Catherine Pooler is being released next week. Catherine has been sharing peeks of the items included in the collection the past few days over on her blog. Have you checked them out? She shared the last peek today. Today's card uses some of the stamps included in this amazing collection. Today is my niece's 9th birthday and this is the card I made for her. I used one of the butterflies from the Butterfly Notes stamp set to create my own patterned paper. Then I stamped the Fill-in-the-blank Birthday stamp set. I love this stamp set so much and I know I will use it over and over again for the many birthday cards I send out. The "niece" stamp is separate. The set comes with 17 separate stamps you can use to personalize your card. So cool, right?!!! The first blog hop is tomorrow. You can start at Catherine's blog, hop along and leave comments for your chance to win this collection. There will be two other blog hops on Monday and Tuesday. So you have 3 chances to win this collection. Make sure you are on the WAIT LIST to be the first to know when this collection is available. Oh, Kristie...this is awesome!! I love how you used the different colored butterflies for the background. The sentiment is beautiful! Happy Birthday to your sweet niece! I am so loving this new collection. Love how you've combined the butterfly stamp with the large sentiment. A real Kristie beauty! So beautiful. I love how you stamped the sentiment directly over the butterflies. REally pretty card, I love your creations! You always do such a nice job. Absolutely love this collection, your card is adorable! Definitely going to CASE this one! Fabulous. I am so excited to be getting this kit. I love this card of yours Kristie. What a wonderful card Kristie - love your colours and that stamps looks awesome. OMG. These colors are beautiful! I love how you created a background using the butterfly and the most beautiful pastel colors! Absolutely "brilliant!" Love the butterfly background. I love butterflies so this is perfect! Great collection!